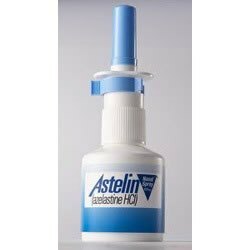 Astelin is an antihistaminic medical product which is released in the form of the spray for the intranasal usage. This drug is one of the best antiallergic remedies by means of the strong pharmacological action. This drug provides the prolonged antiallergic and membrane-stabilizing action, selectively blocks histamine H1 receptors and also prevents the release of the biologically active substances which are responsible for the development of the allergic reactions and inflammations. The active component of Astelin is Azelastin which reduces the permeability of the capillaries and regulates the work of the immune cells. The intranasal spray is easily absorbed from the mucous membranes of the respiratory tracts and quickly concentrated in the blood in the needed dose. Due to this the antihistaminic and anti-inflammatory actions occurs faster than the tablets for allergy. In addition, the intranasal spray Astelin is convenient for those who is not able to take tablets for some reasons but they suffer from the symptoms of the allergy. Astelin is prescribed for the treatment of the seasonal and year-round rhinitis. Spray is prescribed intranasal 1 injection into each nostril 2 times per day. While injecting it the head should be straight. The incorrect use of the spray and throwing back your head may cause bitter taste in the mouth. The length of the treatment depends on the severity of the allergy symptoms and also body reactions of the patient to the treatment. This drug is suitable for the prolong treatment but not more than 6 months running. One more advantage of the nasal spray is an availability of Astelin without prescription unlike the tablets which require the doctor’s prescription in order to buy them. While taking the nasal spray Astelin there may be dryness and irritation of the mucous membrane of the nose in rare cases, disorder of taste, increased drowsiness, nausea, vomiting, thirst, in some cases there also may be the nasal bleeding. The side effects are usually observed in case of the use of the high daily dose, or intolerance of this medication. If the body side effects do not pass within a couple of days, it is necessary to go to the health care provider. Perhaps you will need the adjustment of the course of the treatment and daily dose.